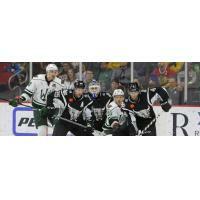 DES MOINES, IA - The Iowa Wild (3-6-2-0, 8 points) were defeated by the San Antonio Rampage (7-2-1-0, 15 points) 4-2 in front of 5,413 fans on Friday night at Wells Fargo Arena. Defenseman Nicolas Meloche tallied two assists to help the Rampage earn a split on the road. Rampage goalie Ville Husso (3-1-0) made 11 saves in the win. Wild goalie Niklas Svedberg (3-6-1) made 18 saves in the loss. Forward Sam Anas scored his first goal of the season in the defeat. Iowa hosts Rockford on Thursday, Nov. 9 at 10:30 a.m.
San Antonio opened the scoring at 4:35 of the first period. Forward Felix Girard scored his fourth goal of the season, giving the Rampage a 1-0 lead. The goal was set up by defenseman Nicolas Meloche. Meloche's shot from outside the top of the left-wing circle rebounded off the left pad of Svedberg, and Girard shot the puck past Svedberg on the glove side. Left wing Julien Nantel extended San Antonio's lead to 2-0 at 15:32 of the period. Nantel's first goal of the year was set up by right wing Reid Petryk, as well as Meloche. After a scramble in front of the Wild net, Nantel beat Svedberg on the high stick side from the slot. Defenseman Alex Grant made it a 2-1 game at 3:52 of the second period with his fourth goal of the year. The power-play goal was set up by forwards Justin Kloos and Zack Mitchell. Kloos carried the puck up the right-wing side and passed it cross-ice to Grant who beat Husso on the short side. At 6:00 of the frame, center Dominic Toninato extended San Antonio's lead to 3-1. Toninato tipped in forward Alex Belzile's shot from the point. Defenseman Mason Geertsen also added an assist on Toninato's third goal of the season. Wild forward Sam Anas scored his first goal of the year at 13:53 of the third period, making it a 3-2 game. Forward Colton Beck and defenseman Zach Palmquist helped set up Anas's wrister from the slot. Right wing Trent Vogelhuber scored an empty-net goal for the Rampage at 19:57 of the period. Vogelhuber's first goal of the season was assisted by forward Adam Musil and made it a 4-2 final score in favor of San Antonio. Iowa hosts the Rockford IceHogs on Thursday, Nov. 9 at 10:30 a.m. The Wild About Education game is presented by Hy-Vee. School workbooks are given out to all kids in attendance at the game. The Wild welcomes the Cleveland Monsters on Saturday, Nov. 11 at 7 p.m. Veterans Appreciation Night is presented by Renewable Energy Group, The IMT Group and Custom Electric. As part of the local concert series, Ted Stockton performs from 5:30 to 6:30 at the north side Bud Light Bar. The first 1,500 fans to arrive to the game receive a baseball hat presented by ALT 106.3 FM, Hy-Vee and Iowa Realty. In honor of Veteran's Day, Iowa Wild players are wearing specialty jerseys. At the conclusion of the game, the jerseys are auctioned off to benefit the ALS Association - Iowa Chapter. Jim Beam Vanilla specialty drinks and the Brewdog pack will be available for purchase at the game. Iowa and Cleveland faceoff again on Sunday, Nov. 12 at 5 p.m. at Wells Fargo Arena. Pucks N' Paws night is presented by Anderson Animal Hospital. The first 1,500 fans to arrive at the game receive a puppy and player calendar presented by LAZER 103.3 and Anderson Animal Hospital. There is also a postgame skate following the conclusion of the game, presented by Smock Industries. The Subway combo pack is available for purchase at the game. After a road game in Rockford, Iowa returns home to welcome the Grand Rapids Griffins on Friday, Nov. 17 at 7 p.m. It is a Red Kettle game with the Salvation Army. There is a commemorative puck giveaway with a donation to the Salvation Army. It is also a $2 beer night presented by 100 .3 The Bus. The Collegeville pack is available for purchase at the game, presented by KISS FM. The Iowa Wild 2017-18 season is presented by Mercy Medical Center: and runs from October through April. Fans may purchase seats to see any of the team's 38 regular season home games at Wells Fargo Arena. Season tickets to see the Wild play its 2017-18 season at Wells Fargo Arena start at just $10 per game. For more information on tickets, including ticket plans and group seating, please contact the Wild ticket office by calling 515-564-8700 or go to www.iowawild.com .